1917-1918 The Passport Acts of February 5, 1917 and May 22, 1918 make entering the US without a passport or other travel documentation illegal. 1918 Codification of Alien Enemies Act of 1798, 50 U.S.C 21-24, permitting apprehension and internment of aliens of “enemy ancestry” by U.S. government upon declaration of war or threat of invasion. The President is given blanket authority as to “enemy alien” treatment. Civil liberties may be completely ignored because enemy aliens have no protection under this 200+-year-old law. Government oppression is likely during wartime. 1939-1940 President Franklin D. Roosevelt authorizes creation of new secret intelligence agency to be deployed for espionage and counterespionage in the Latin America. Federal Bureau of Information (“FBI”) chief, J. Edgar Hoover, creates the Secret Intelligence Service in July 1940. 1936-1941 Various governmental bodies, such as the FBI, special intelligence agencies of the Department of Justice (“DOJ”), the Office of Naval Intelligence, and the Army’s Military Intelligence Division compile lists of dangerous “enemy aliens” and citizens, including the FBI’s Custodial Detention Index (the “CDI”). 1940 The US census data includes specific listings and location of persons based on their ethnicity, which may have assisted the U.S. Government in later identification of “suspect” individuals of “enemy ancestry.” Secret Intelligence Service, charged to identify Latin American potential enemies secretly authorized by Roosevelt. J. Edgar Hoover officially creates S.I.S. July 1, 1940. 1940 Alien Registration Act of 1940 passed requiring all aliens 14 and older to register with the U.S. government. 1941 Roosevelt issues Presidential Proclamation 2497 setting forth the Proclaimed List of Certain Blocked Nationals following Britain’s example. The proclamation lists Axis citizens and businesses with which the U.S. could no longer deal. Dec 7, 1941 Japan bombs Pearl Harbor. Pursuant to the Alien Enemy Act, Roosevelt issues identical Presidential Proclamations 2525, 2526 and 2527 branding German, Italian and Japanese nationals as enemy aliens, authorizing internment and travel and property ownership restrictions. A blanket presidential warrant authorizes U.S. Attorney General Francis Biddle to have the FBI arrest a large number of “dangerous enemy aliens” based on the CDI. Hundreds of German aliens are arrested by the end of the day. 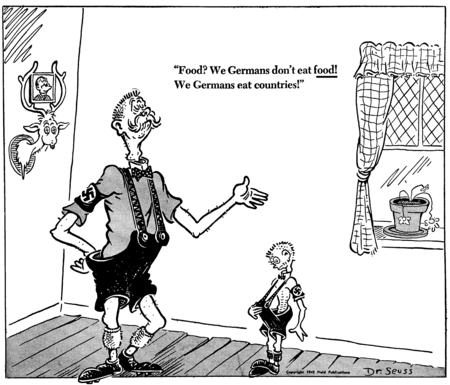 The FBI raids many homes and detains many hundreds before war even declared on Germany. Martial law declared in Hawaii and hundreds of US citizens and aliens of German ancestry interned, as well as those of Italian and Japanese ancestry. By Dec. 10, 449 Japanese, German and Italian aliens were interned, as well as 43 German, Japanese and Italian American citizens. Dec. 11, 1941 U.S. declares war on Germany and Italy. 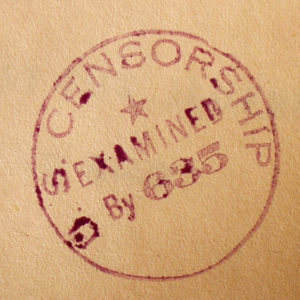 Dec. 19, 1941 Executive Order 8985 establishes Office of Censorship. Jan.-Feb. 1942 In cooperation with the military, the DOJ establishes numerous, small prohibited zones strictly forbidden to all enemy aliens. DOJ also establishes extensive “restricted areas” in which enemy aliens are subject to stringent curfew and travel restrictions, particularly on the West Coast. Jan. 1942 Emergency Advisory Committee for Political Defense created at conference of Western Hemisphere countries in Rio de Janeiro to monitor “enemy aliens” in Latin America. Laws established similar to enemy alien laws in the US requiring aliens from Axis nations to register with their local authorities, restricting travel and personal property rights and subjecting the aliens to increased surveillance. Naturalization procedures slowed. Detention of “suspicious” enemy aliens urged. Cancellation of citizenship recommended for “suspicious” native-born or naturalized citizens from Axis nations. Once citizenship cancelled, detention as enemy alien possible. Feb. 19, 1942 Roosevelt signs Executive Order 9066 authorizing the Secretary of War to define military areas in which “the right of any person to enter, remain in or leave shall be subject to whatever restrictions” are deemed necessary or desirable. This order applies to all “enemy” nationalities. March 11, 1942 Roosevelt signs Executive Order 9095 establishing the Office of the Alien Property Custodian pursuant to authority granted under the Trading with the Enemy Act of 1917. Pursuant to the order, the property interests of all foreign countries and their citizens vested in the Alien Property Custodian at his discretion until such time as he relinquished control of those interests. This Order created havoc in the lives of many internees and their families, particularly when the heads of households were arrested. October 1942 Wartime restrictions on Italian Americans terminated. 1942 U.S. Government initiates exchanges of approximately 2,650 internees for Americans held in Germany. 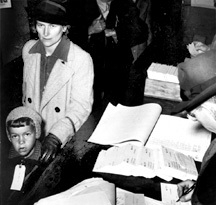 Six exchange voyages carry many families to Germany, including American-born children and U.S. citizen spouses of German alien internees. As the war progresses, travel across the Atlantic is increasingly hazardous. Upon arrival in war-ravaged Germany, exchangees are unexpected and unwanted by their families. Many are suspected of being spies. Families with young children, some even born during the trip to Germany, have to make their own way to family homes through hazardous countryside, frequently in winter, carrying all their worldly belongings. Some men are beaten and arrested by the Gestapo as spies and put in camps, leaving families destitute again. 1943 Emergency Advisory Committee adopts U.S. Department of Justice/State Department resolutions to allow U.S. to provide detention accommodations and shipping expenses for Latin Axis nationals to the U.S., a process already underway for the past eighteen months. 1942 – 1945 Thousands of German aliens and German Americans are arrested, interned, excluded, paroled, exchanged and generally harassed by a suspicious country. Few know why they are interned or for how long. Internees try to make lives in camps, attempting to ignore the psychological and physical upheaval to which they have been subjected. Mental anguish, anger, guilt and shame are common. 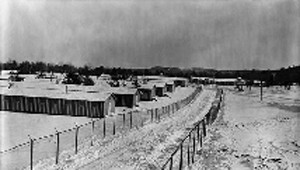 Armed guards and guard dogs watch over internees living in huts or dorms in barren parts of the country surrounded by barbed wire, observed from guard towers. All mail is censored. Contact with the outside world is severely limited. Many continually appeal their internment orders. DOJ generally ignores their requests, requiring unobtainable “new evidence” for consideration of appeals. Some are granted rehearings, pursuant to which an even smaller number are released. Released internees do not know why or ever learn why they were interned. Those released are generally subject to parole restrictions. Many internees are pressured to repatriate. Hopeless and bitter, many agree and are readily used for exchange. Some are exchanged against their will. 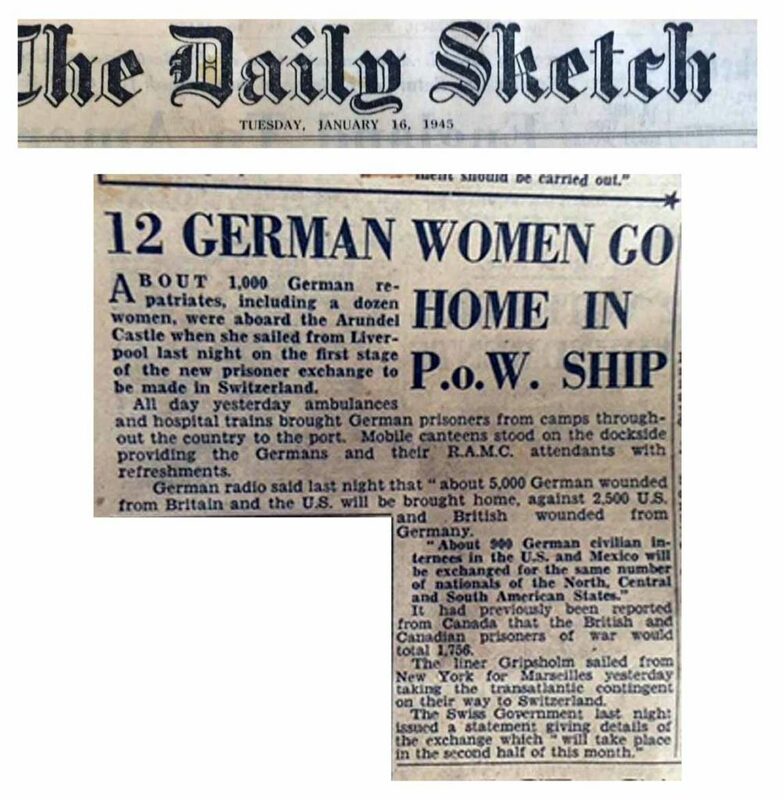 There were six exchanges with Germany, primarily of civilians, but also of POWs. One trip of the SS Gripsholm in January 1945 involves 1,000 exchangees. The government arranges for “trustworthy” able-bodied men to work outside camps. One group works on the Northern Pacific Railroad in North Dakota repairing the railroad tracks and living in boxcars with coal stoves throughout the winter. Others work for the Forest Service and 3M. May 7, 1945 Germany surrenders. July 1945 Truman issues Presidential Proclamation 2655 authorizing the U.S. to deport all enemy aliens deemed “to be dangerous to the public peace and safety of the United States.” This affects hundreds, if not thousands, of internees who remain imprisoned indefinitely. Aug. 14, 1945 Japan surrenders. November 1945 Many internees are released from camps and parole limitations for most persons are terminated. Internment camps are progressively closed and remaining internees are eventually consolidated at Crystal City and Ellis Island. Some internees continue to be sent on prisoner exchanges. April 10, 1946 President Harry S Truman issues Presidential Proclamation 2685, superseding Presidential Proclamation 2662, reauthorizing the U.S. Secretary of State to order the repatriation of dangerous enemy aliens deported from Latin American countries during the war and deemed 30 days as a sufficient period for deportees to get their affairs in order for deportation. Latin American Program. Late 1947 Crystal City family camp closes. Those still imprisoned, exclusively German internees and their families, are transferred to cramped Ellis Island where others are held. Virtually all are of German ancestry. Over the next year, many additional persons are returned to Germany. Others are paroled or unconditionally released to return to their homes. The barbed wire exercise areas overlook the Statute of Liberty. The captives contest repatriation and deportation by pooling their limited funds to finance appeals in court. July 1947 S. 1749 introduced by Sen. William Langer of North Dakota for “the release of all persons detained as enemy aliens.” The bill did not pass, but the internees got a voice in Congress and the legislation gave them hope. June 21, 1948 In its 5-4 Ludecke v. Watkins decision, the Supreme Court tacitly upholds the Alien Enemies Act by denying the writ of habeas corpus for release from detention sought by German internee, Karl Ludecke, pursuant to Presidential Proclamation 2655. Mr. Ludecke had been interned since December 1941 and was resisting deportation. August 1948 Due in large part to Senator Langer’s efforts, among others, the last person, a German internee, is finally released from Ellis Island, almost three and a half years after cessation of hostilities with Germany. No internee was ever convicted of a war-related crime against the United States. Upon release, most adult internees sign secrecy oaths; many are threatened with deportation with no prospect of return if they speak of their ordeal. Most internees, always fearful, take the secret to their graves. Camp employees also sign oath of secrecy. The secret is well kept. Few today know of selective internment. Internees and excludees return home to suspicious communities, some have been interned 6-7 years. Children do not remember life without barbed wire. Homes and livelihoods are lost. Reputations destroyed. No safety net protects them. They confront feelings of confusion, anger, resentment, bitterness, guilt and shame. They try to understand what happened and repair broken lives. The experience scarred families forever. Those exchanged to Germany struggled to survive in the extremely difficult postwar years. Some exchangees returned to the U.S. years later. Frequently, American-born children left their families behind in Germany in order to do so. Many never were allowed to return. Others, embittered by what they perceived as America’s betrayal, never wanted to come back. Some repatriates had been returned to Soviet-occupied eastern Germany or died directly due to deportation. 1980 Commission on Wartime Relocation and Internment of Civilians (“CWRIC”) created. Focused primarily on the relocation of Japanese and Japanese Americans, the CWRIC did not allow German Americans or other European Americans to testify or offer written testimony on their wartime experiences. The final report, Personal Justice Denied, focuses primarily on German American individual and group exclusion issues under Executive Order 9066. It identifies only 4 DOJ internment camps. The tribulations of German internment are barely reviewed. The CWRIC asserts that the minimal hearing process afforded by the DOJ to enemy aliens is sufficient “rough fairness” under the circumstances. The CWRIC is wrong. Lacking sufficient due process protections, this “rough fairness” frequently resulted in unjustified, painful years of captivity, exchange and property loss for thousands. 1988-present Civil Liberties Act of 1988 passed solely giving redress to and acknowledging injustices to Japanese Americans and Aleuts. No German American or other affected European American allowed to give oral or written testimony on their wartime experience during congressional hearings. Civil Liberties Education Fund established to fund projects relating to public education regarding the Japanese American experience. National Park Service study funded to designate Japanese relocation camps administered by the WRA as national historic landmarks. In January 1999, the U.S. settles Mochizuki class action agreeing to monetary redress of $5,000 and a presidential apology for Japanese Latin Americans. 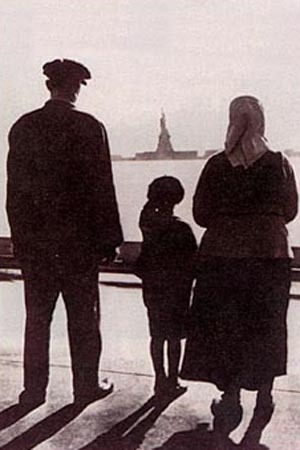 In November 2000, the Wartime Violations of Italian American Civil Liberties Act signed into law recognizing only the government’s wrongful denial of Italian American civil liberties. In February 2005, Wartime Parity and Justice Act introduced for third time to provide for the inclusion of Japanese Latin Americans in the Civil Liberties Act of 1988, among other things. March 4, 2004 U.S. House of Representatives passes HR 56, originally introduced by Michael Honda (D-CA) supporting the goals of the Japanese American, German American, and Italian American communities in recognizing a National Day of Remembrance to increase public awareness of the events surrounding the restriction, exclusion, and internment of individuals and families during World War II. Companion Senate Resolution did not come to a vote. Only adopted federal legislation to date acknowledging German American WWII internment experience. November 16, 2005 U.S. House of Representatives passes HR 1492 to provide for the preservation of historic confinement sites where Japanese Americans were detained during World War II and setting aside $38 million for this purpose. German and Italian Americans and Latin Americans and Japanese Latin Americans who were detained at many of the same DOJ internment facilities as Japanese Americans are not included in bill. The companion bill, S. 1719, is pending before U.S. Senate Committee on Energy and Natural Resources. June 30, 2005 The Wartime Treatment Study Act (“WSTA”) is introduced in Congress for a third time. Two previous attempts at passage fail to clear procedural hurdles. The legislation would establish a long overdue commission to study the wartime treatment of Germans and Italians during World War II. Senators Russell Feingold (D-WI) and Charles Grassley (R-IA) introduced the legislation in Senate as S. 1354 and Rep. Robert Wexler (D-FL) introduced measure in House as HR 3198. On Nov. 17, 2005, the WSTA was voted favorably out of the Senate Judiciary Committee, but died at the end of the Congress without coming to a final vote in the House and the Senate. March 10, 2009- present The Wartime Treatment Study Act is introduced for the fourth time on March 10, 2009, at the beginning of the 111th Congress. On October 21, 2009, it is reported favorably out of the US House of Representatives Judiciary Committee. Unfortunately, it never comes to a vote in either the House of Representatives or the Senate and dies once again at the end of that Congress in December 2010. It has not been reintroduced, primarily due to Sen. Feingold’s loss of his Senate seat in the November 2010 elections. Reintroduction is not anticipated at this time, leaving German Americans and Latin Americans the only group of WW II civilian internees unacknowledged by the US government.